I can only imagine how satisfied the crew is now that they've arrived at their destination, cleaned up, and begun to enjoy their weekend in Cooperstown. 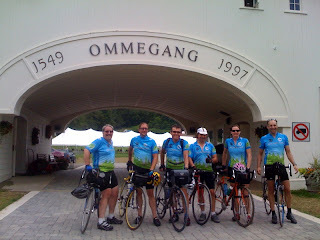 I'm only disappointed not to have received a picture, Tour de France style, with the riders each holding a goblet of beer as they approached the Arc de Ommegang along les Champs Cooperstown (pardon my, um, er, French). 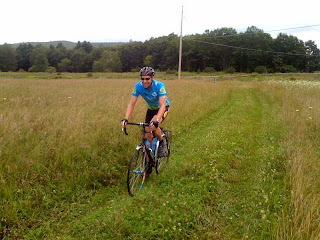 Without further ado, here's Chris LaPierre with the 6th installment of his chronicles of the bike trip to Ommegang. See you tomorrow, folks. "This is the place." That's what Brigham Young declared when he stopped his carriage in Utah and let his pilgrims know that they had arrived at their destination and ended their spiritual journey. Unlike Brigham's followers we knew where we'd end up all along, and there was BEER waiting for us there! Today's ride was once again beautiful. 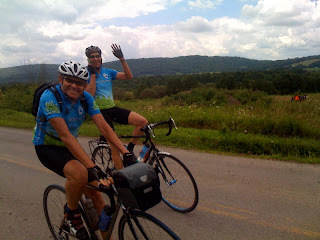 Jeff finally got a flat, leaving Pete and Don the only tourists unscathed. Otherwise, it was a great ride with smooth roads, little traffic, beautiful scenery, and relatively (important word) little climbing and cool temperatures. Jeff just has a knack for sniffing out the most bike-friendly roads. We arrived at Ommegang where the Beer Lass, Amy from Nodding Head, Bear from Stockertown Beverage, and George and Nancy from Home Sweet Homebrew greeted us with cheers and cameras. There are obvious benefits of touring, health and fitness, the outdoors, beautiful scenery etc. 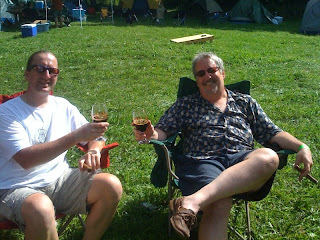 And there are obvious benefits of this fest, roughly 200 beers from around 75 breweries in one place at one time. But here are my favorites about each. The great thing about touring is that you see and experience things and meet people that you never would from behind the wheel of a car. I could have driven the exact same route up here and said "that was a beautiful drive." But I'm pretty sure I wouldn't have seen the bears, or the peeing gnome, or half of the architecture, signs, foliage, or subtleties that I did. I also would have missed out on a lot of conversation. People just don't walk up to you and say "I see you're all traveling by car," or "how's your trip been?" Then there's Belgium Comes to Cooperstown. Yes, the fest is great, it's well-run, there's a ton of great beer, and it's one of the only intentionally UNDERsold festivals I've ever been to. But those four hours are nothing compared to the brewing community camaraderie I feel on Friday night. One thing I love about being a member of this group is how friendly, tight-knit, and non-competitive it is. With a few unfortunate exceptions, the brewers, brewery owners, salespeople, and beer writers are one big family. We visit each others homes, attend each others events, and even each others weddings and funerals. When we all get together it's a great time. Friday night of Ommegang is all about saying Hi to people you haven't seen in a while and appreciating each others artwork. That's where I am right now. 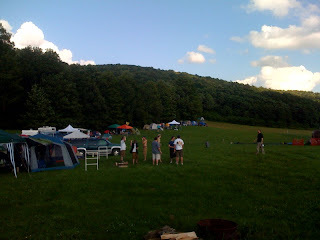 Just wandering around the grounds at Ommegang with a red solo cup, visiting old friends and saying, "hey, what are you pouring at your campsite tonight?" Well it's almost time for the "VIP" beer dinner. Looking forward to what's on tap tomorrow! I trust everybody had a good time and you're all on your way back by now. Cheers!